While the mention of England third kits generally call to mind the sky-blue Umbro shirts of the late 1980s and early 90s, the concept goes back more than a decade and a half beforehand. 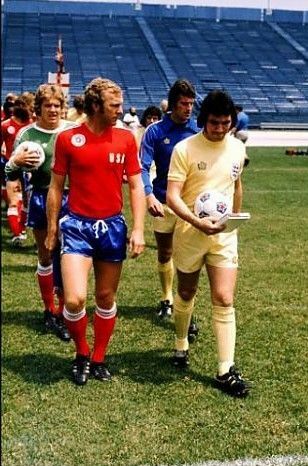 Three times in 1973 – against Czechoslovakia, Poland and Italy – England wore yellow shirts and blue shorts and so, when Lee Hermitage requested Admiral third strips for FKF, he wanted to see what both the yellow and sky blue would look like. For the sake of completeness, we should point out that an all-yellow Admiral kit was worn against Team America – essentially an NASL selection – in the USA Bicentennial Cup in 1976, but that was not a full international.